Amendment to Basic Law on the Government limits number of government ministers, raises electoral threshold. 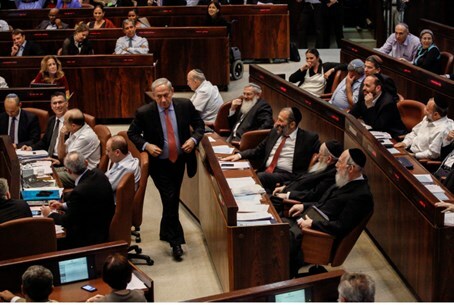 The Knesset passed Tuesday morning the amendment to the Basic Law on The Government known as the “Governance Law,” with 67 in favor, and none voting against or abstaining. The law limits the number of government ministers to 18 and stipulates that all ministers will have portfolios. It also raises the electoral threshold required for a party to enter the Knesset to 3.25% of the total votes cast in national elections. Opposition MKs decided to boycott the vote and were absent from the plenum. They held an "alternative debate" in the Knesset's Negev Hall Monday and criticized what they said were undemocratic moves by the government, which is passing three controversial laws this week.